The Home Visit starts with a cat and ends with a dog. I look out from my kitchen window on high and see that my two visitors are standing on the street corner, against the pub wall, holding their ground as they are early. The first is dressed in black and white. The second holds a stool. A pub regular sits on a stool in the doorway up from them. I wave from my window but they can’t see me, so I put on my shoes and go down the stairs to hail them. The black and white cat is sitting like an ornament, behind the glass window of the downstairs flat. This is the first time she has held her ground. She is only two months old, and previously has ran for cover. We come past her and come up the stairs to my flat. We leave Emma, as previously instructed, sitting on her stool outside the door to my flat. Sogol has been once to the house before, with Birthe. She takes her black shoes off and places them on the red mat. We enter the lounge, and she asks where to sit. I have swithered over this before the home visit- the hard back chairs or the L-shaped red settee? In the end I decide any visitor is always offered the comfy seat, so a ‘performer’ should be no different. I leave her in the room, to prepare to ‘veil’. I nip out to mention to Emma that that the neighbours don’t know I am arty so they may ask questions, and that she is welcome any time to come into the hall if she is uncomfortable. It is strange that this is the only possible tension in my mind to surface before the visit. Emma, who is very cheery in her role, declines. As I move through the rooms adjacent to where Sogol is sitting, to wash my hands and to sit on my stairs, I am aware that she is in the room even though I can’t see her. It’s not quite like leaving a guest, as she has given instructions to leave her for two minutes to prepare. When the time is up, I enter the lounge. Sogol is sitting where I indicated, but further to the end of the settee than I thought she would, either to make room for me to sit next to her or to give a little distance. Her dark hair has been brought forward over her face, and roughly follows its contour, plaited in place below her chin. Her nose slightly pokes through. She sits with her socked feet together, raising her toes once in a while. I then see that she has two lengths of poppers, on black strips, which she holds in one hand and has it coil at her feet. The kitchen clock ticks. The buses run past on the Gallowgate. Sogol slowly begins to press together each popper, like a different kind of ticker tape of time. At first I mirror how she is sitting, and wait to see if she looks for a response in me. Her face, covered in hair, reminds me of the custom of the Burryman, a male who would cover his face and body entirely in burrs. She has a benign presence, neither sorrowful nor aggressive. As she slowly fastens the strip of press studs together, it is more like she has a craft or task that she will sit to do until completion. I realise that with her presence here in the house, I could move off or around or do other things, and that gives me the freedom to draw rather than photograph her, to give me a task to do. I wonder can I make her warm, as I have the window open. I can’t ask her, as speaking doesn’t feel right, so instead I keep drawing. The presence of the sitter, outside the door, is definitely one I am aware of too. It does feel like a two person piece, of the performer and the waiting person; or three if you count myself. I think about the difference between sitting with Sogol in a gallery, or sitting with her on this Home Visit. The Home Visit gives the homeowner more control in a sense to decide how to respond. I feel companionship and think of women and craft. 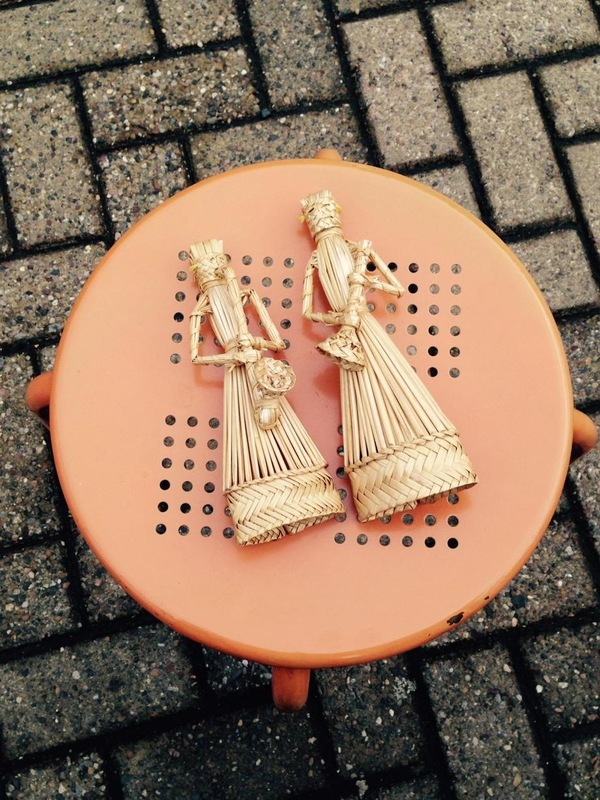 I have two corn dollies, picked up from a Cornish charity shop, that are sitting on a shelf in the lounge. The way Sogol’s hair is plaited, their strange faces or masks and the act of women twisting the corn to make them, makes me think they are the right votives, even guardians for this home visit. I want to give my visitors something from the house. When Sogol has completed her task with the line of press studs around half an hour later, she reaches into her pocket and takes out some hair clips and a hair band. She puts the band on the bottom of the main plait and frees the middle plait that has kept the hair over her face, drawing it backwards and re-securing it to back of her head, thus revealing her face. The performance has finished when we make eye contact. I get up and go and get the two corn dollies. 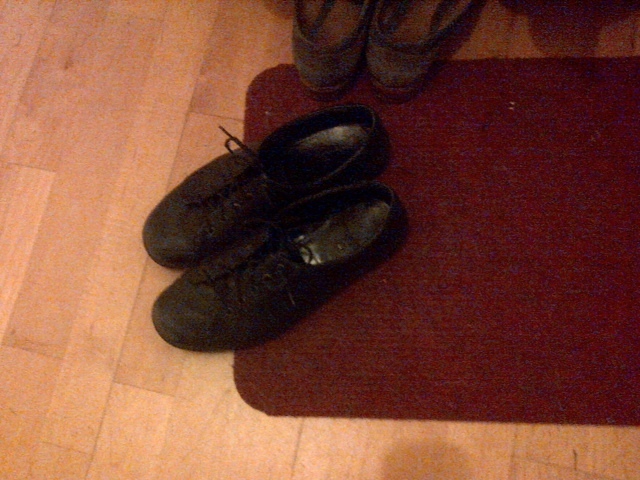 I give one to Sogol, and when she has put her shoes on, I open the door. Pavel, the neighbour from upstairs, is coming down with his black and white collie Monty, who always likes me to fuss him. Pavel says hello and apologises, moving on through and down the stairs for the dog walk. Their presence nicely brings the Home Visit to conclusion, and I hand the second dollie to Emma, to signify I was aware she was there too. Sogol and Emma leave and the Home Visit is over. Sogol Mabadi is conducting four Home Visits as part of her residency ‘Invitation no.1: Home Visit‘ at Creative Lab, Centre for Contemporary Arts, Glasgow, Sept 2015. Emma Reid is her assistant for the Home Visits. 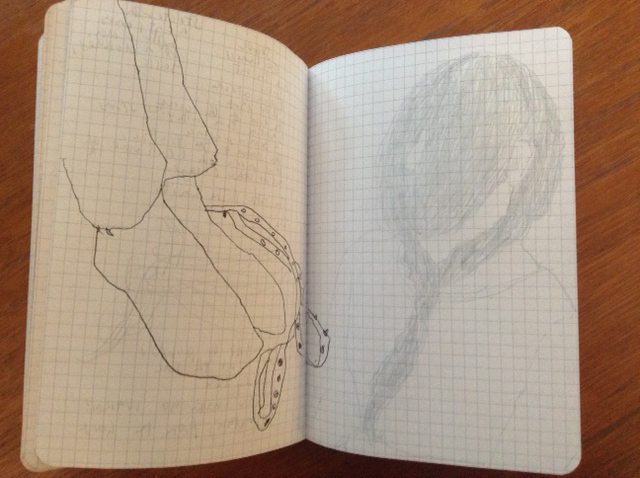 This entry was posted in Writing and tagged CCA, Creative Lab, Emma Reid, Glasgow, Home Visits, Sogol Mabadi. Bookmark the permalink.